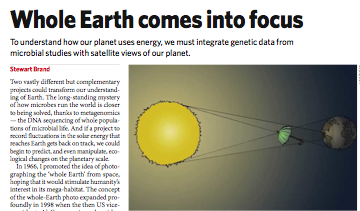 Our own Stewart Brand has an essay in the current issue of Nature (subscription required) on integrating two disparate disciplines in order to solve our worlds largest problems. To understand how our planet uses energy, we must integrate genetic data from microbial studies with satellite views of our planet. Two vastly different but complementary projects could transform our understanding of Earth. The long-standing mystery of how microbes run the world is closer to being solved, thanks to metagenomics — the DNA sequencing of whole populations of microbial life.